I swung my legs out of bed on Monday morning and felt pain. My legs were aching! I reckon it was to do with all the uphill walking the day before. Maaaan – it was a while before I stopped hobbling! I had a day trip planned today, but I decided to delay my journey for an hour to chill out a bit with a coffee first and catch up on writing my blog. 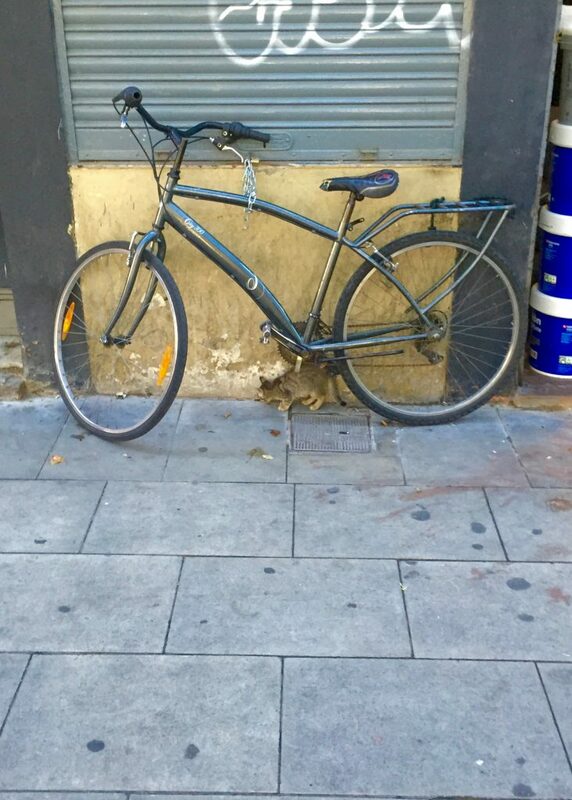 I headed out on to the Rambla del Raval, and caught a tiny kitten cowering under a bike, while a dog on a lead strained to get at it. I was a bit worried it out was on its own, but it skipped into the shop next door and ran up to a man in there, so I guess it was his. 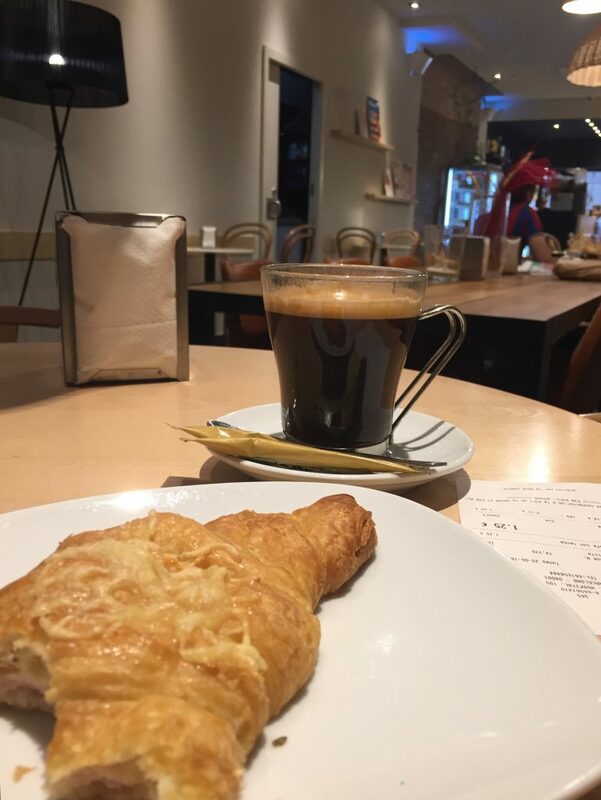 I headed around the corner to a cafe, and sat down with a jamón y queso croissant and americano. My croissant was heated, but how come when ham and cheese croissants are toasted, they’re never properly hot? The ham was still chilled, so it wasn’t a great breakfast! After a quick trip back to the hotel, I got on the move. 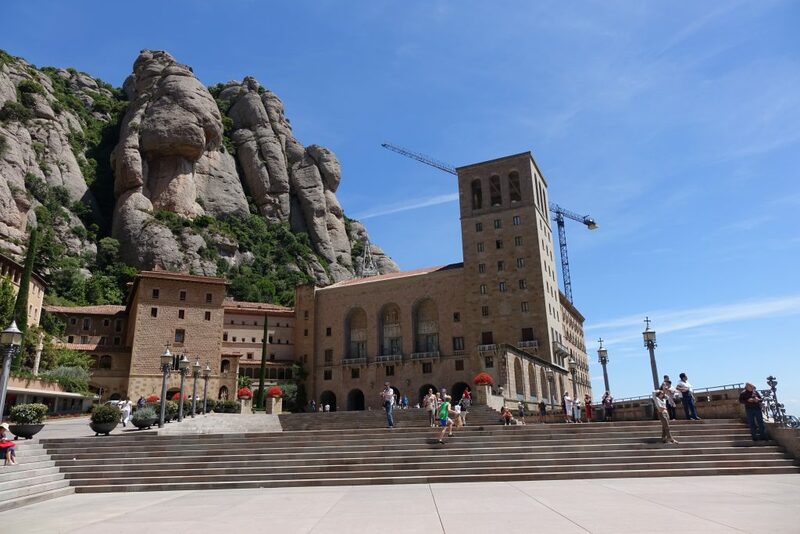 I was going to visit the Monastery of Montserrat. 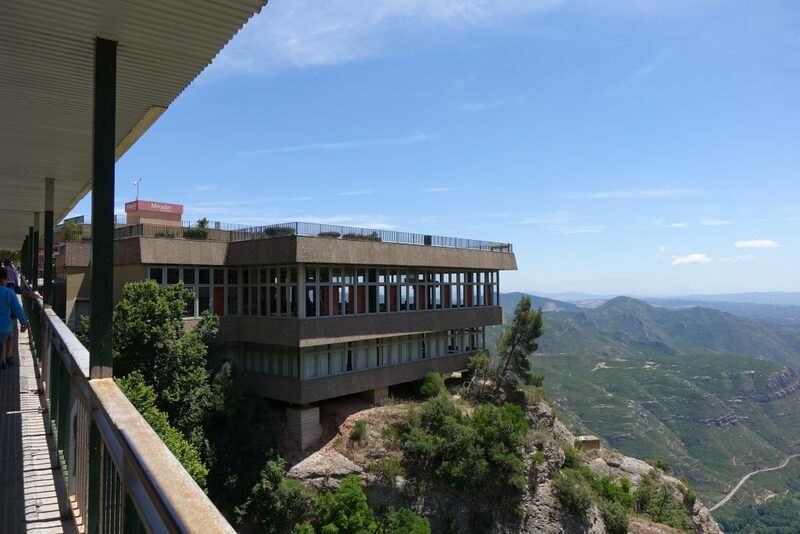 I’d looked up day trips from Barcelona, as I wanted to see someplace outside the city, and this looked like the most spectacular destination I could visit. I headed to the Espanya train station, and eventually found a small desk with a lady helping tourists work out how to get to the monastery. but I decided to wait and see where I wanted to eat and whether the museum was worth it when I got there. The ToTMontserrat cost €46.20. 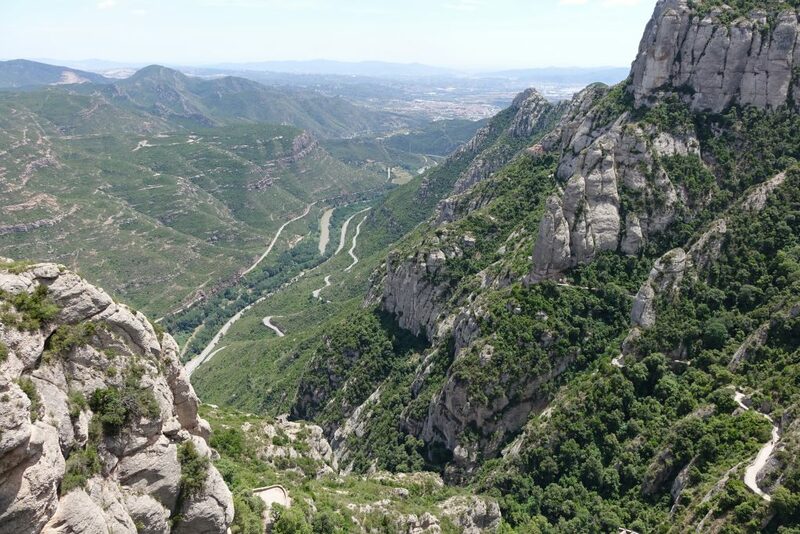 All in all I think the tickets are pretty good value, but I think I went with the right one in buying the TransMontserrat. There’s loads of good advice on how to get to the monastery from Barcelona here. Your ticket does everything, so hang on to it, whichever one you buy! 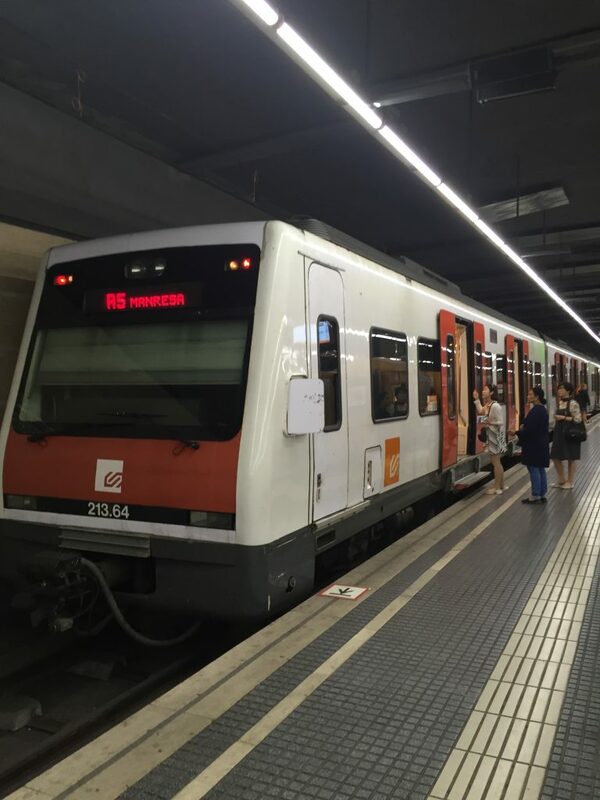 I got on the train 10 minutes before it was due to depart, and I literally got the last free seat on the train, so arrive at Espanya early if you want to sit down! 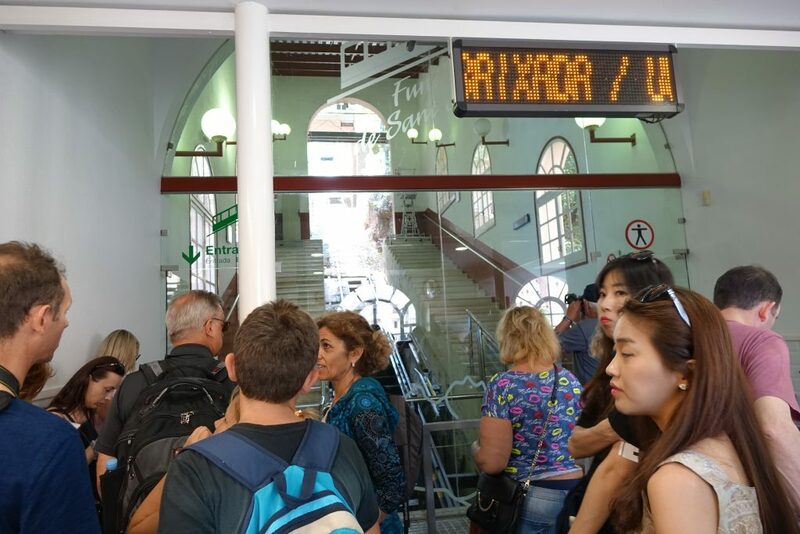 The hour long journey was pleasant enough, and before I knew it I was getting off the train at the stop for the cable car (stay on the train for one more stop if you’re taking the funicular). I soon discovered there was only one cable car making its way to the monastery at any one time. They hold 35 people…. …which meant there was a long queue, and I was right at the back of it. Cable cars leave every 15 minutes, and it was 45 minutes before I boarded one. I was already beginning to regret choosing a later train. 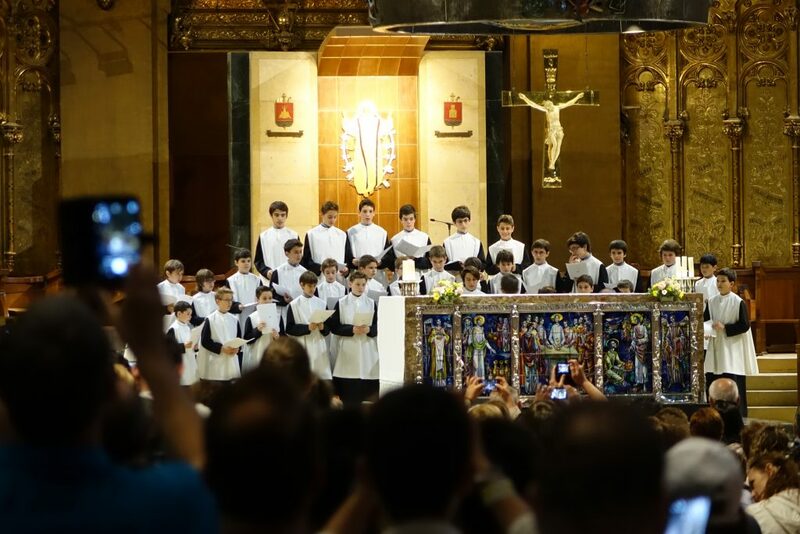 One thing I wanted to see was the Monastery’s boys’ choir which sings at 1pm each day, and I was worried I wouldn’t make it to the top in time. 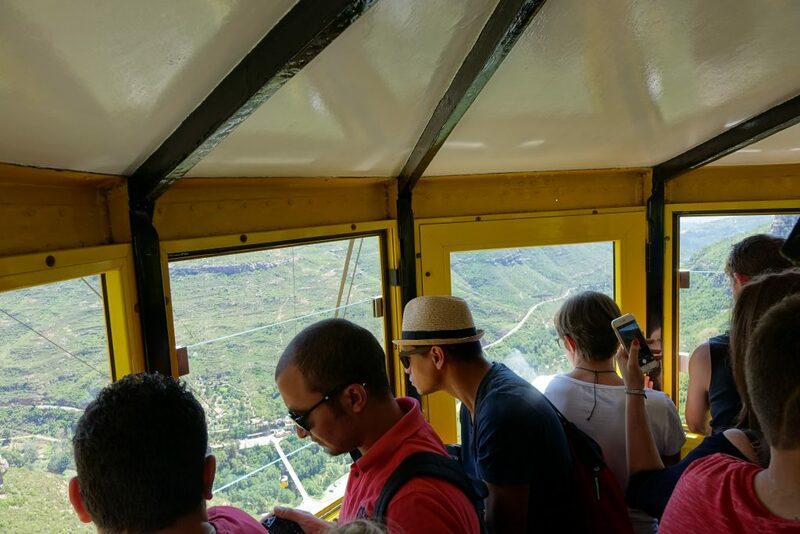 Eventually though, I was on board, and the cable car was soon whisking me up to the summit. The cable cars were apparently installed in the 30s, which made me slightly nervous when I realised how high above ground we were! And you can’t sit down either – there’s no seats! After a five minute journey, I disembarked and walked up to the monastery. 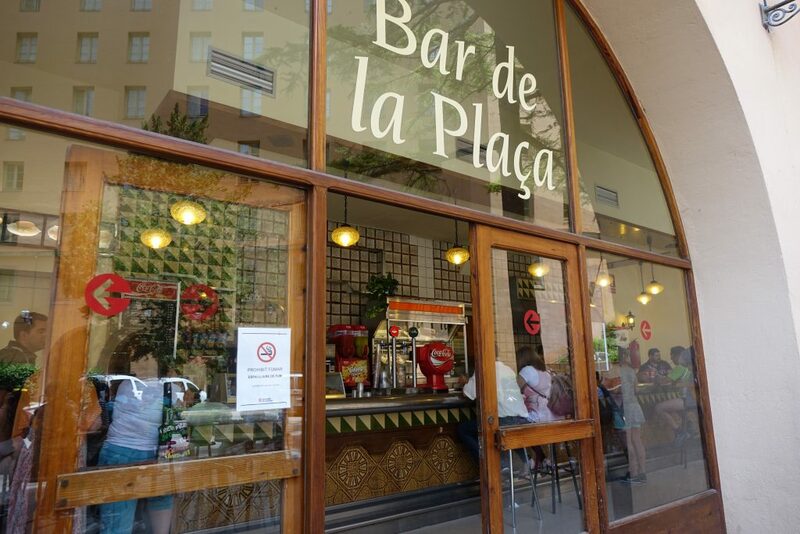 There’s quite a few things around it – a few shops, restaurants, one hotel, a bar and so on. 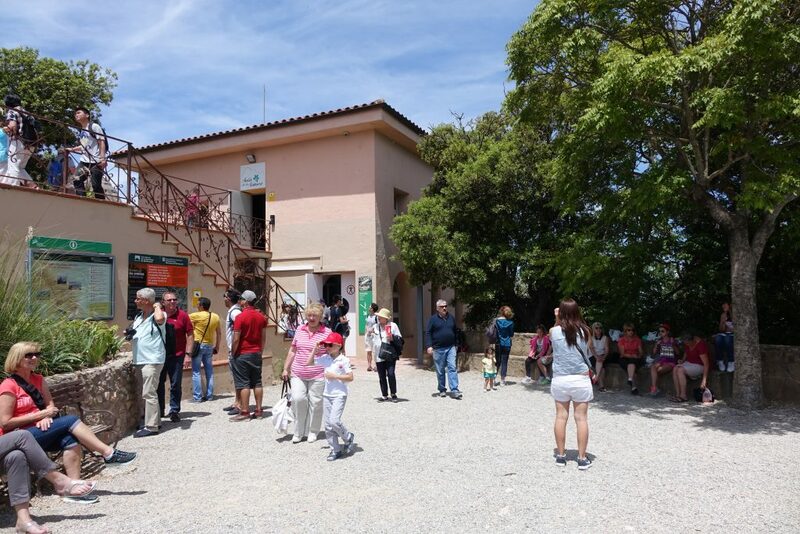 There’s also a small tourist information office, so I headed in there and asked where the choir was due to sing in about fifteen minutes time. It wasn’t too far away, so I headed to the monastery itself. 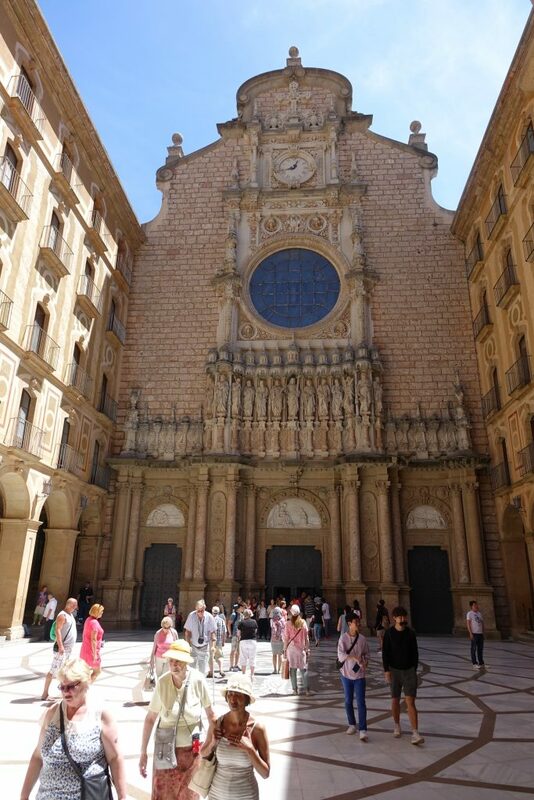 And passed through a lovely square towards the basilica. 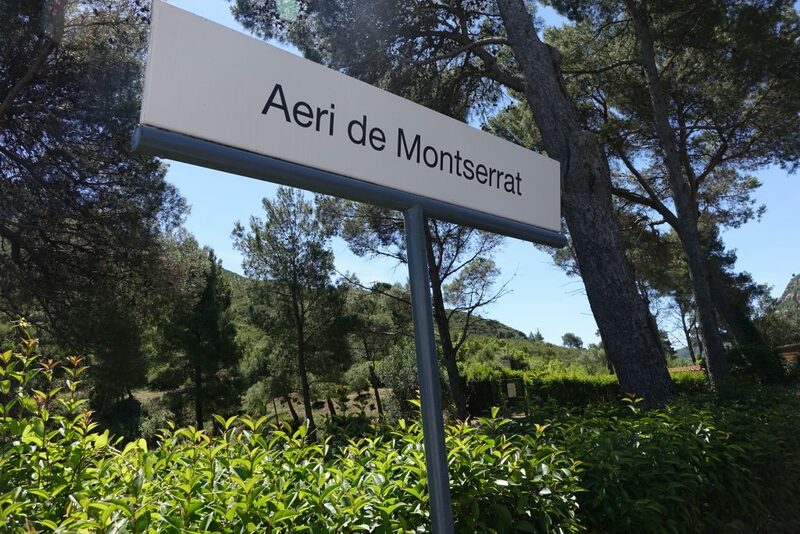 I thought Montserrat was a bit of a hidden gem, and would be pretty quiet, particularly on a Monday. However, I was very wrong. 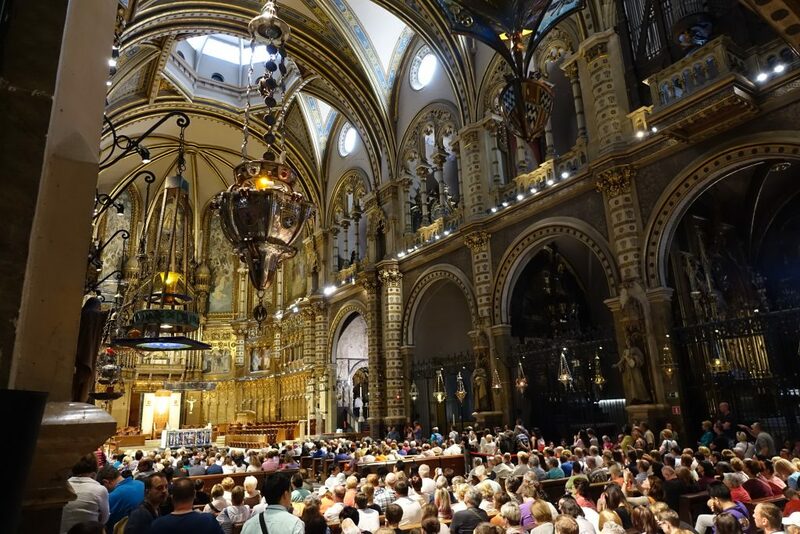 The basilica was PACKED with tourists all filming on their iPads (I cannot understand that) and GoPros on sticks. It was – yet again – an amazing building, but though I was there ten minutes before the choir were due to sing, it was standing room only! And it was a big space. It was a very calming experience, despite the hoards, and a priest (or a monk, not sure which) explained a bit about the monastery and asked everyone to join him in a prayer too. I have to say I left a bit before the short service was over – I wanted to avoid the scrum for the single door exit at the back! Gazing out over the mountain when I came out, I spotted a big cross on a hillside way in the distance. I could just make out some tiny people beside it, and thought that’s where I’d get the best photo of the monastery in its cliffside setting. I marked it with a circle in the pic below! If I got to one place while I was here, I wanted to make it there. First though I decided to go for lunch. There’s a cafeteria right beside the monastery, but it didn’t look that great, so I decided to head to the main restaurant building to the right of the monastery. By now I was pretty hungry. 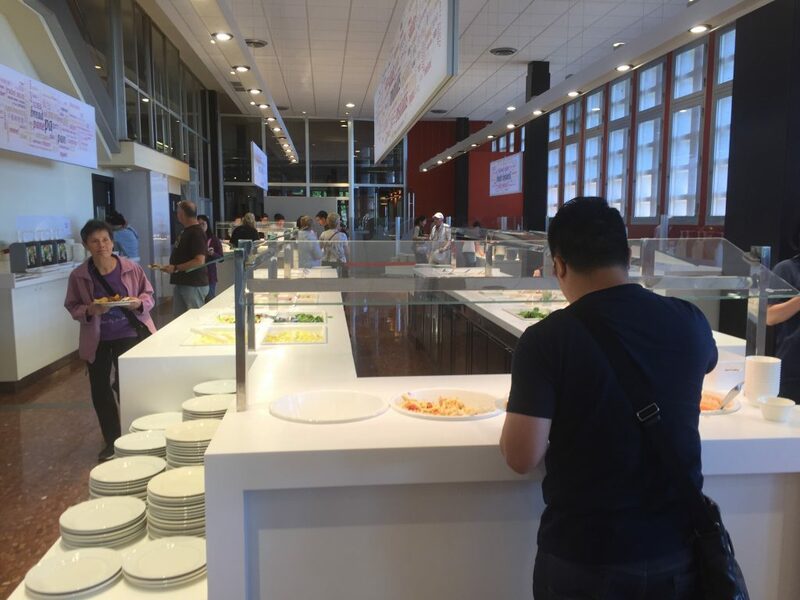 There were a couple of options inside – a full service restaurant, a wee cafe and a buffet. 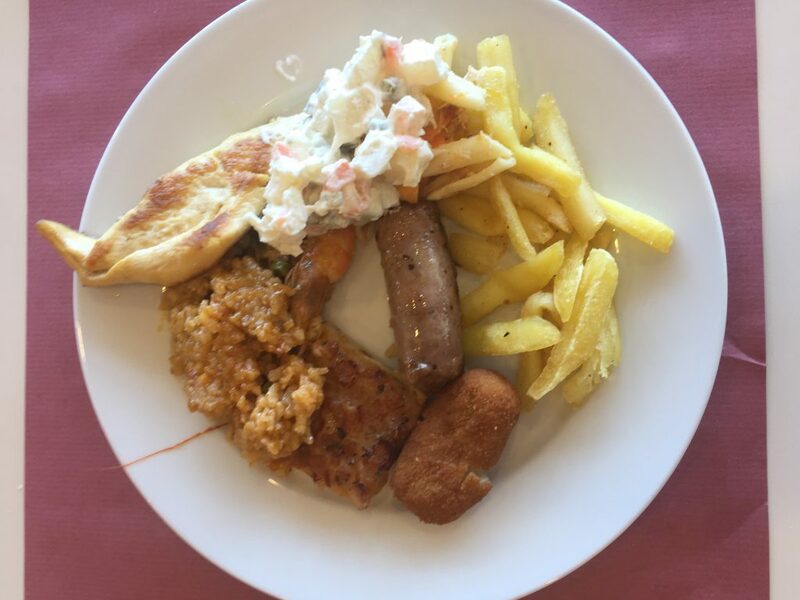 I decided to go for the buffet. 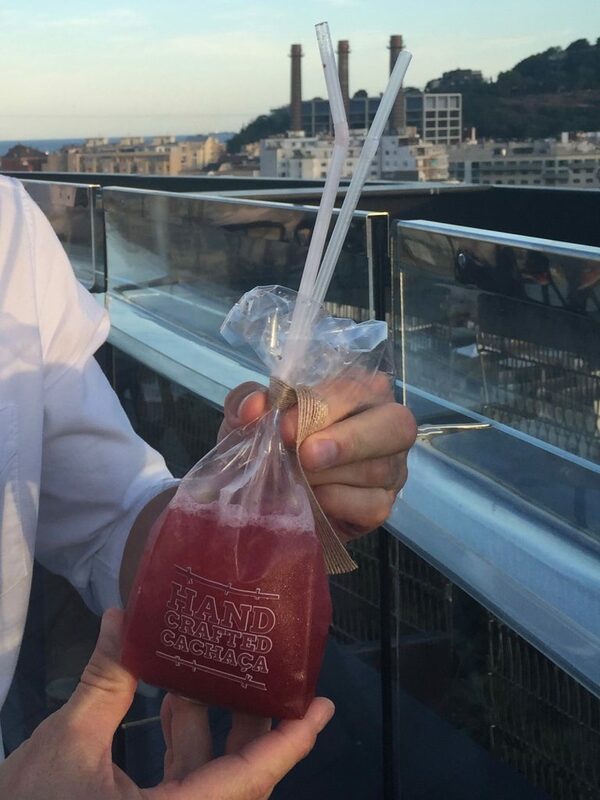 I think it was about 18 euros, which didn’t seem too bad. But let’s just say the food isn’t going to win any awards any time soon! 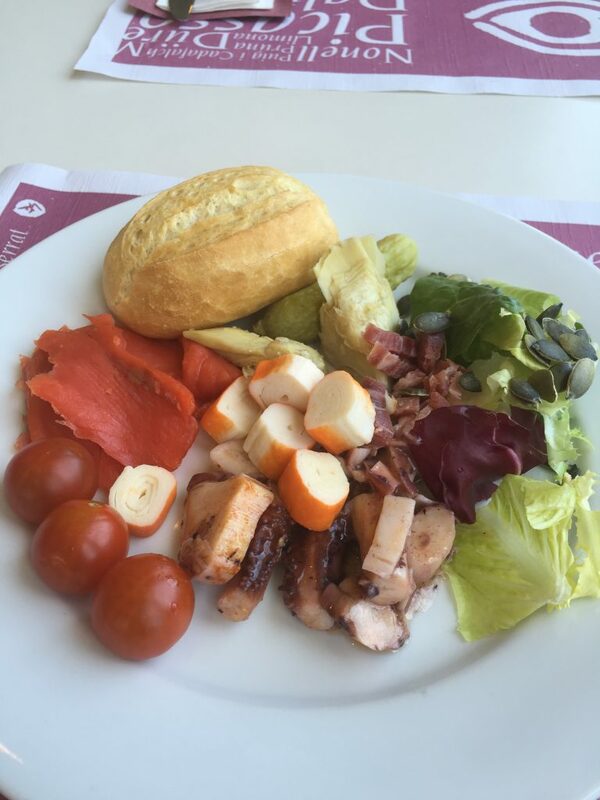 This was my starter salad. They’ll do you a sandwich, and it’s a much nicer place to sit! It’s in the square to the left of the monastery. Disappointing lunch over, I tried to work out how to get to the cross I’d seen earlier for my photo. 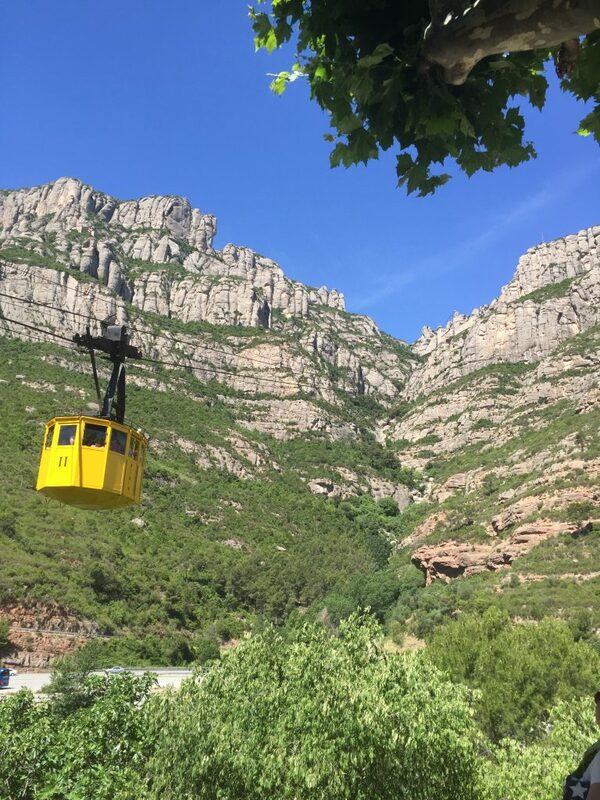 There’s two funicular railways once you get to the monastery level on the mountain – the Sant Joan, and the Santa Cova. 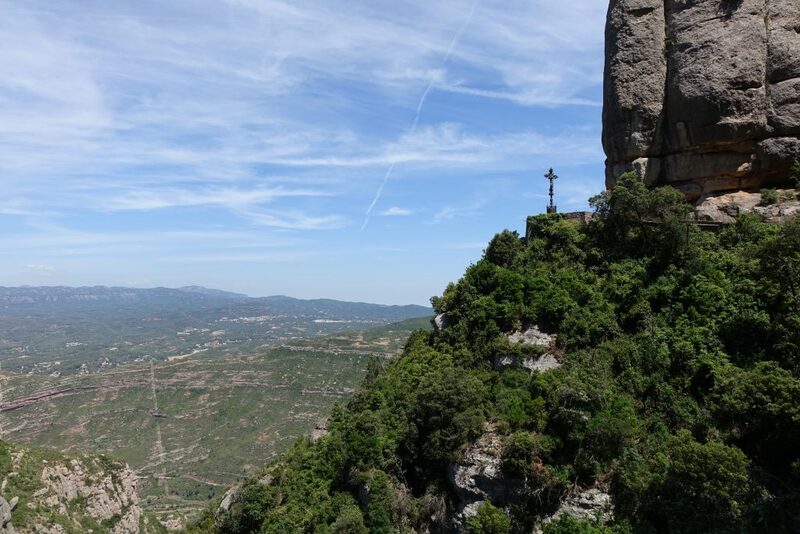 I knew the Sant Joan went to the top of the mountain, so I thought that was the one I needed to get to the cross. There was another queue…. 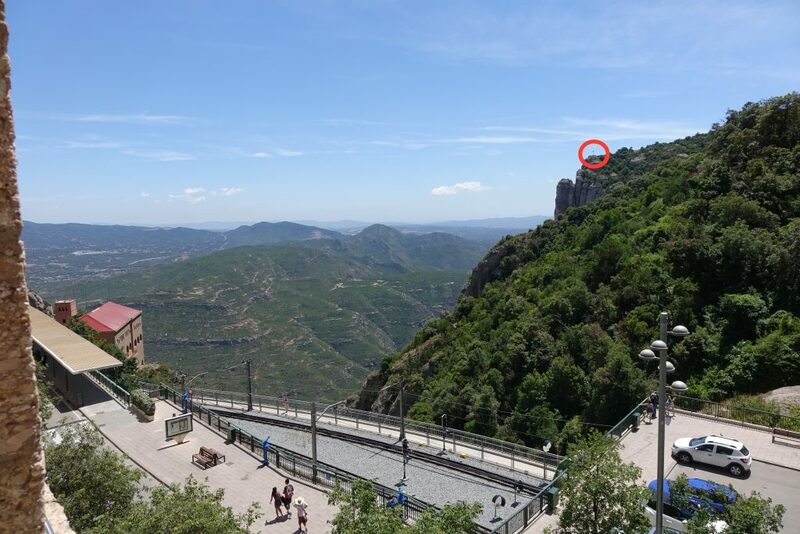 But this time I made it on the next funicular to leave, and soon we were climbing our way to the very top of the mountain. I got off, and had a look around…. 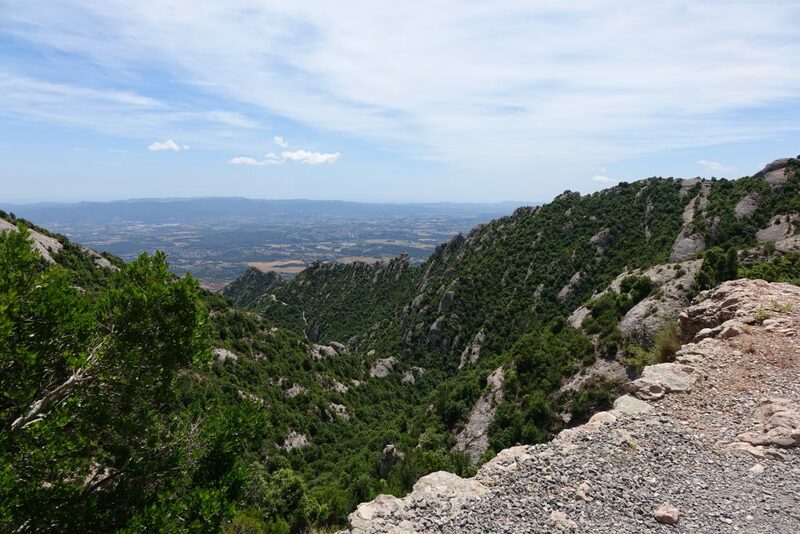 and that was it – I quickly made my mind up that all that was up here was mountain hikes, which I really didn’t have time for. So I cut my losses and headed back down on the funicular. I was a bit disappointed by now as I thought I’d missed my good photo opportunity from the cross. I was also beginning to run out of time if I was to be back in Barcelona by 5ish – it was already 3pm. 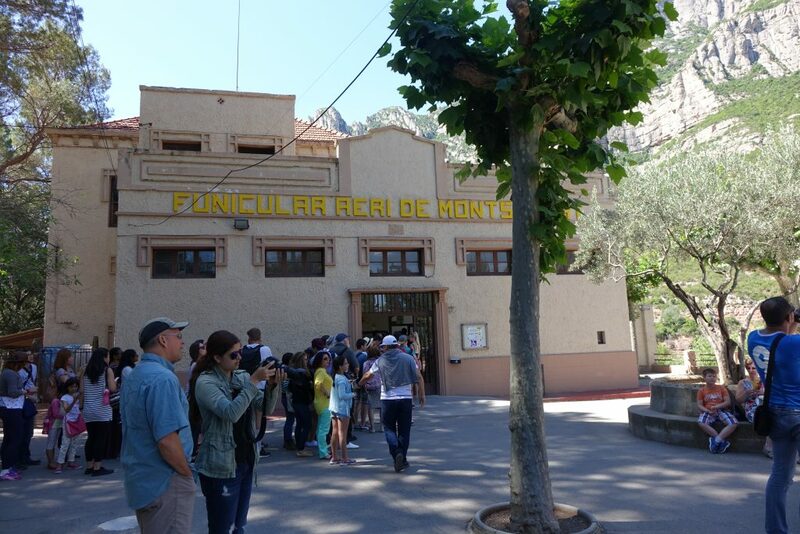 I grabbed a quick Magnum from the small supermarket and then worked out I really only had time to try the Santa Cova funicular or visit the audiovisual experience, and decided on the former. So I hopped on it, and was a bit gutted when it started going downhill instead of up! I got off, and calculated I had twenty minutes before the return funicular, so I decided to head out along a path. 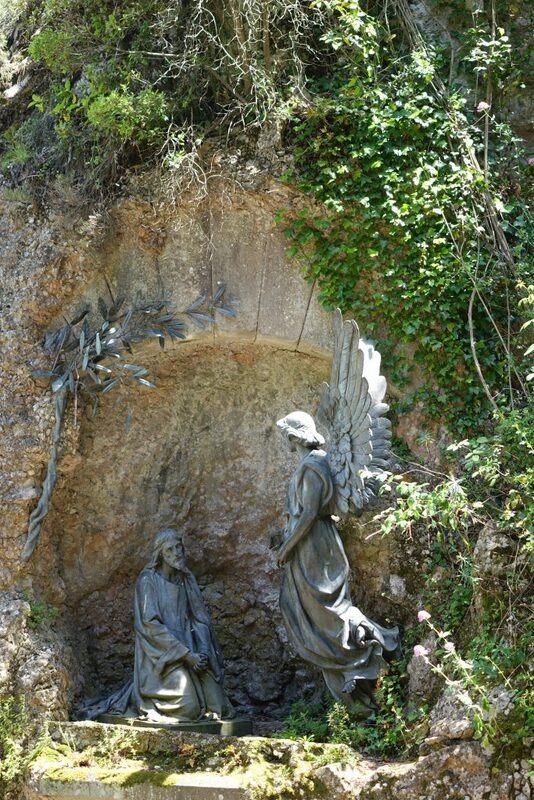 En route, the views were pretty spectacular, and there were religious statues dotted along the path. Turning a corner, I eventually came across – the cross! I headed up to it, turned around, and there it was – the view of the monastery I’d been wanting – it’s a great view and photo opportunity. Pretty stunning! 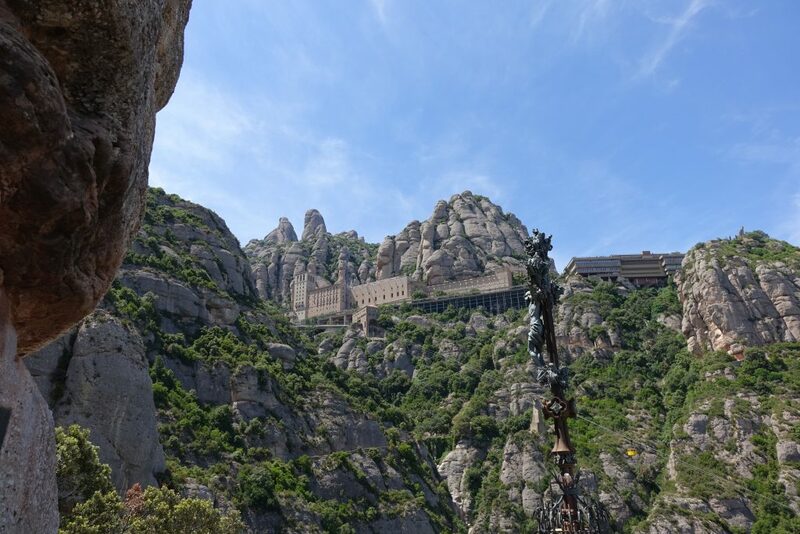 I climbed back to the funicular stop, arriving just in time to go back up the mountain to the monastery level. By now, I was out of time, and needed to get back to the city. I was a bit annoyed I hadn’t given myself more time. I’d been there for three hours and just didn’t seem to have done that much! I reckon it’s worth at least five hours once you get to the monastery to see everything properly. I didn’t see the museum, audiovisual experience or even the rest of the monastery or basilica – (there were really long queues to get in to that). I was annoyed my visit had been so fleeting and hurried really. 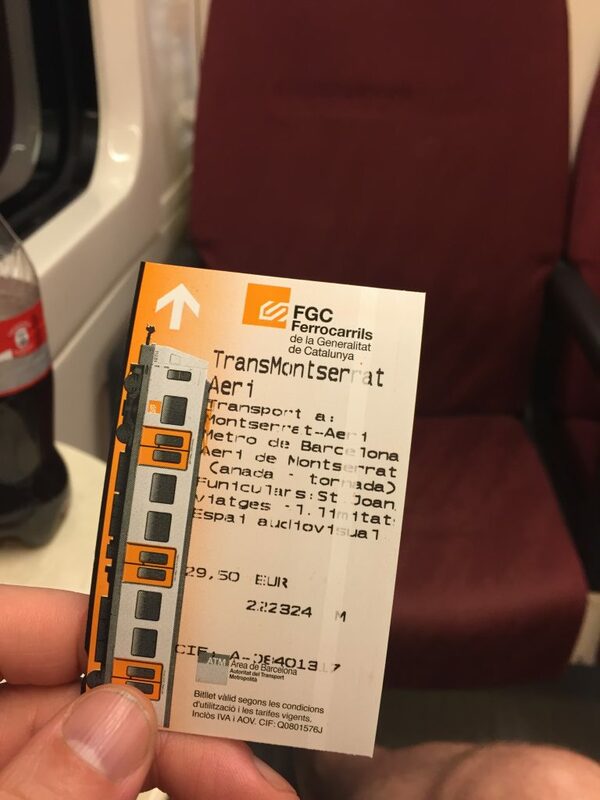 After an uneventful cable car ride back to the train station, we were warned the next train left for Barcelona in two minutes, so I ran to the platform and jumped on to the train, and was soon speeding back to the city, dozing off on the way. After a quick shower (separately thanks!) 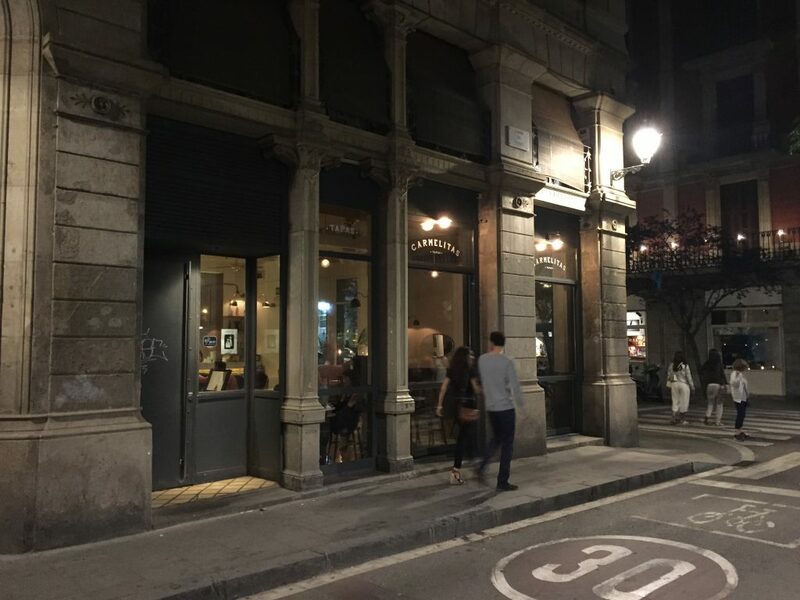 we headed out to grab a bite to eat in El Raval. Our first option was really busy, and required an hour long wait, so we headed along the road to a place I’d seen a couple of nights before that I thought looked decent – Carmelitas. We both ordered the burger, and man was it delicious! I’d definitely recommend it – cooked rare-ish, it was gorgeous. 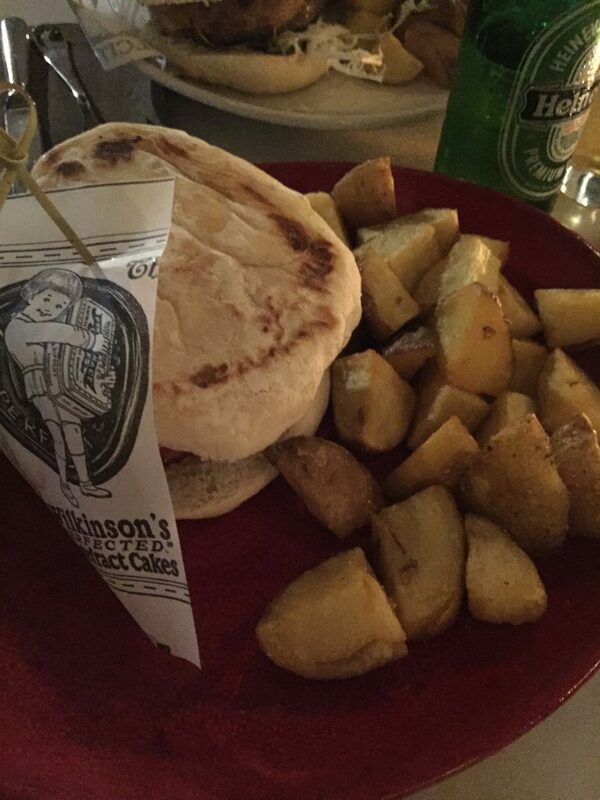 Not that you can actually see it in that picture for the bread, but you’ll just have to trust me. After dinner with a beer (and red wine for Neil) we headed back along the road to the first place we’d tried for a meal for a drink – Marmalade. 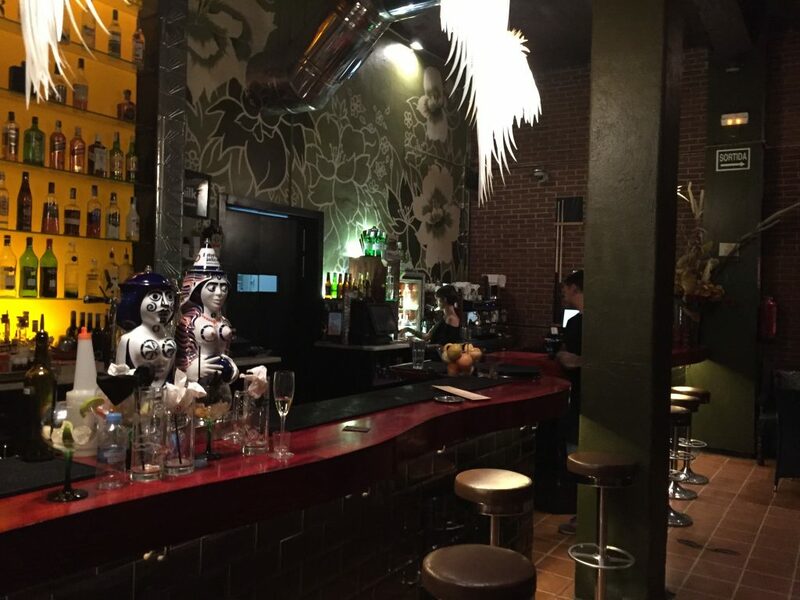 It was a friendly feeling place, and the first thing we noticed were how cheap the drinks were! Result! That was taken at the end of the night when we were the second last people in there, it was much busier earlier! It was really great to catch up with Neil, and we chilled outside, chatting with our beers for a good while. Unfortunately when we tried to get more drinks at 2am the bar was closed, boo! So rather than head on and try someplace else, we headed back to the hotel, both keen to be up and out early the next morning.